Credit: NASA/JPL. Download this image (PNG, 221 KB). [02-Jan-19] The first 90 days of the SWOT science mission will be flown in a "fast-sampling" phase that revisits specific areas once per day. This phase will begin after a 90-day commissioning phase for engineering checkout and adjustment. This image shows a map of the 1-day repeat orbit that will occur during the calibration-validation (CalVal) phase for SWOT. The lines are color-coded by time within the 1-day repeat period. 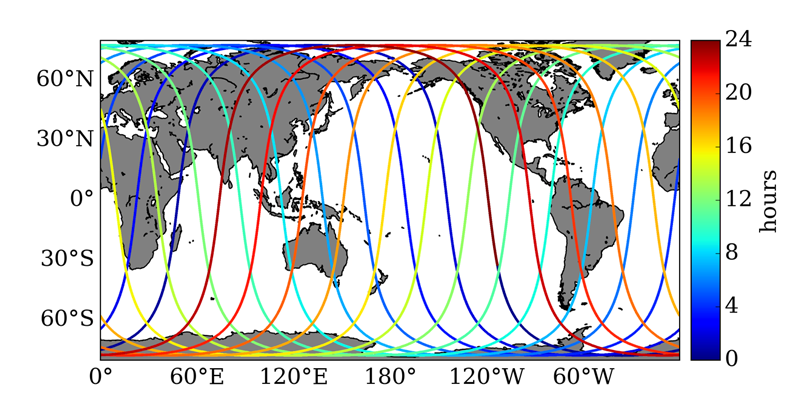 The fast-sampling phase (January to March 2022) is intended for process studies with a reduced coverage, providing observations in the Northern Hemisphere winter and Southern Hemisphere summer. SWOT measurements are not impeded by clouds, so the synoptic maps of sea surface height provided by SWOT will track fine-scale circulation features at daily intervals (twice daily at crossovers) during this fast-sampling phase. Further details of the various orbits are available from AVISO.